The poor countdown timer here at DadsWorksheets has been neglected for some time, and with the site having gone through some significant technology upgrades, the timer became something of an orphan child, replete with scars and an inferiority complex, you know that one you keep in the closet and hope that at some point it’s just going to have an owl swoop in with an engraved invitation to go off to magic timer school where it saves the world or something. You don’t need to invoke specialis revelio to see this is a wizardly improvement over the old timer. Obliviously one big change is the circular timer graph, which provides immediate feedback about how far along the timer has progressed. 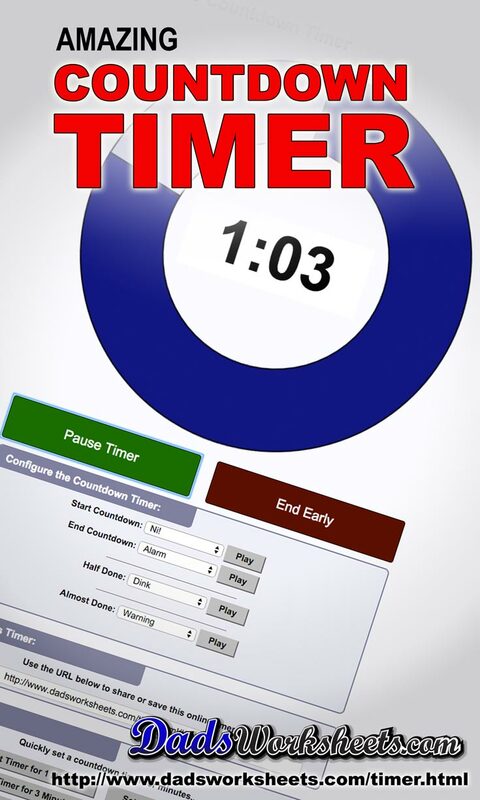 It also lets you trigger sounds when the timer reaches the halfway mark or nears the end of the time you assign, and there are preset buttons like “Set Timer for 10 Minutes” and similar amounts that let you very quickly configure the timer for frequently used times. As with the previous timer, you can save a URL that has all of your specific settings so that it’s easy to return to a timer ready to go. While we’re using this as a timer for math tests and worksheets, it’s perfect for anything where you need a countdown. Use it as a classroom timer, a recipe timer or to keep track how long that pectrificus totalus is going last.